Lower Manhattan, as viewed from Jersey City, the morning of my Big Walk. The best immersion into the bright lights of Manhattan? 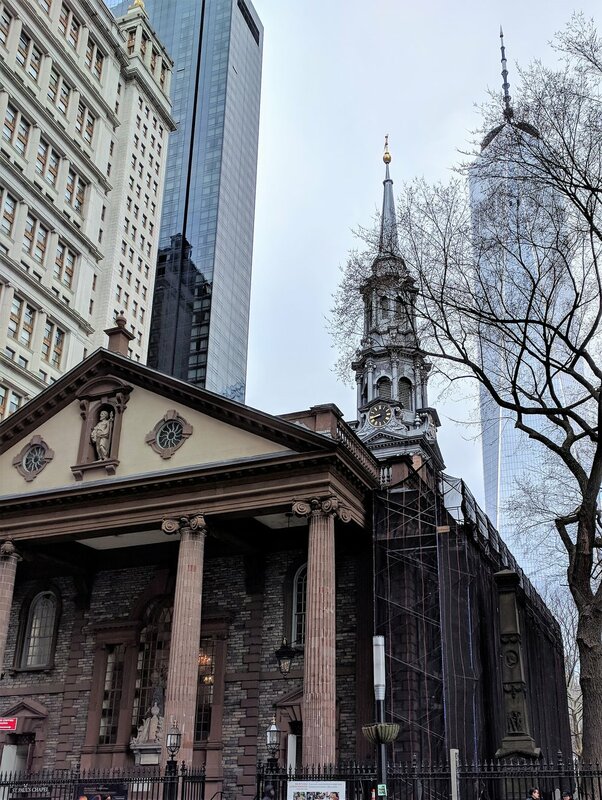 Mine is to start at the top and walk to the bottom -- thirteen miles along Broadway Street: views of Gotham in its entirety from sparsely populated Inwood down through Battery Park, history dating back to the Dutch settlers of New Amsterdam, not to mention great exercise. Nicole and I spent five days back in our adopted hometown of NYC last week. Before heading in, I texted a good friend of mine: "You going to be around Sunday morning? I'm headed into the city this weekend. If you want to get crazy, I was toying with the idea of walking the length of Manhattan. I've done it before, 13 miles, tough but doable." His response: "Lol. I'm around and of course am game for anything." And just like that, the Big Walk was on. There are any number of routes to trek the the whole island, but only one runs continuously the entire length: Broadway. 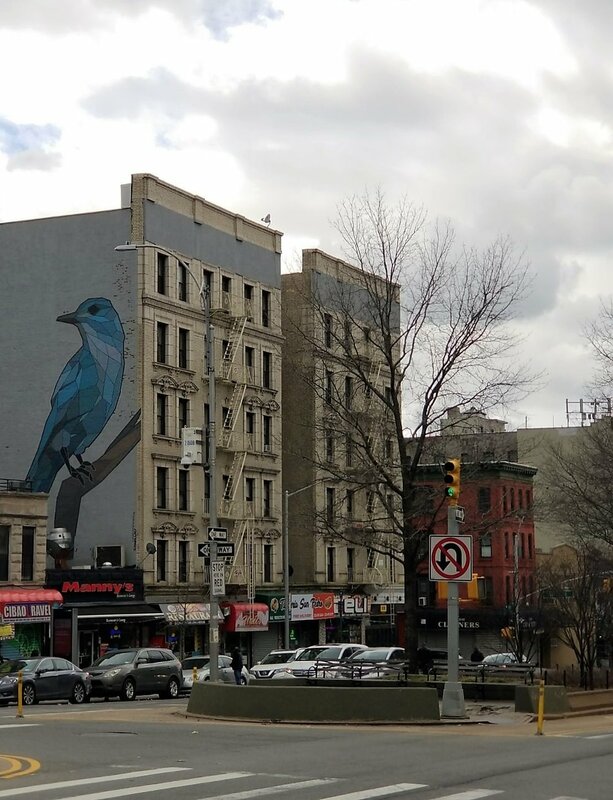 Manhattan's longest street, snaking 13.3 miles, Broadway began as a Native American trail, grew as a Dutch settlement road during the Seventeenth Century, and today is one of the most well known thruways in the United States. Walking it offers glimpses of countless Big Apple mainstays -- from relatively sparse Inwood and Washington Heights in the north; down through ever emerging Harlem; into the heart of old money Upper West Side; by electric Times Square and the Theater District; skirting the flagship Macy's store and iconic Flatiron Building; through SoHo and into the Financial District beside the Charging Bull of Wall Street; before ending just short of Battery Park at the southern tip of the island looking out upon the Statute of Liberty. I'm not alone in my enthusiasm for the Big Walk. Trekking Broadway has become a thing. Although definitely not as popular as watching baseball at Yankee Stadium or riding the elevator to the Empire State Building lookout, a growing cadre of fans have embraced strolling Manhattan tip to tip. These guys made a movie about it ("There’s one more item every New Yorker might want to add to that city bucket list — and it’s a lot healthier than eating at Shake Shack and more exciting than standing in line for the Statue of Liberty.") Another New Yorker walked every street in Manhattan but saved Broadway for his final capstone hike ("I saved Broadway for last. In addition to being New York's most iconic street, at 13.3 miles it's also the longest.") The New York Times even gets in on the action ("Whether you are a native New Yorker or a new one, Broadway will eventually intersect with your hopes and dreams."). The walk is fun, great to do with friends, and offers an entirely unique vantage of the Big Apple. Easily one of my favorite NYC things to do. Travel north to south to finish in a more central location. With respect to direction, most people go north to south, traversing the sparse northern sections at the beginning and building to the busier Times Square on down to the Financial District. One big advantage of this route is getting the lengthy subway ride to 225th Street out of the way prior to the walk, not when worn out afterwards. Beat the crowds by going south to north. On the flipside, to make the best time, it's better to start in Battery Park and go south to north. The southern half of the island is much busier and heavily populated than the north. Waiting at crosswalks for traffic to clear and dodging people on the sidewalks severely slows things down. 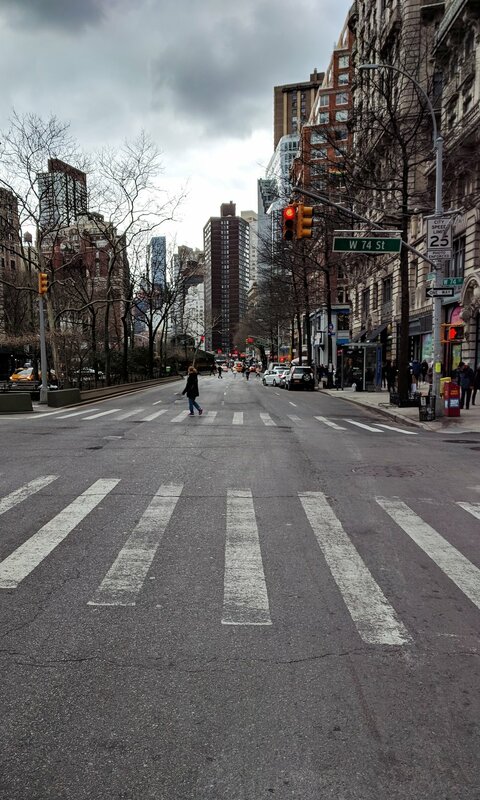 By starting early in the morning before the streets are busy (i.e., before 9am or so), it's possible to have these busier portions of Broadway to yourself at the start and make good time through Times Square and beyond before heavy congestion sets in. The streets and sidewalks above Harlem are less busy and much easier to navigate. Having said all that, I've done the walk in both directions and, honestly, either way is great. Elevation change is negligible. Many internet commentators recommend going top to bottom, solely in order to be travelling "downhill." That's largely bunk. According to this topographic map, the elevation gain at the northern end of the island amounts to approximately 150 feet. Over 13 miles, not a big deal. Make your directional choice based on other factors outlined above. Use the subway at 225th Street. 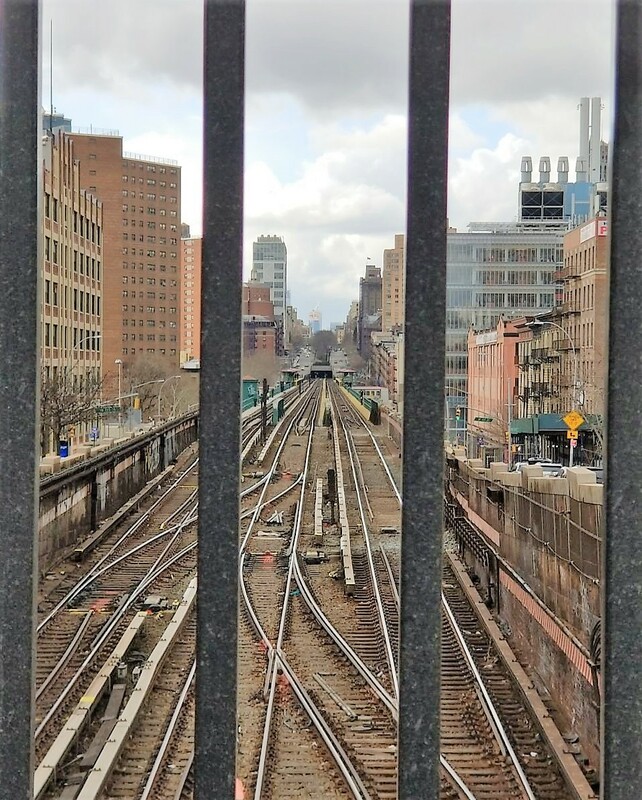 The fastest and cheapest way to get to (or from) the northernmost part of Manhattan is the on the Number 1 subway line exiting at 225th Street. $2.75 for a single ride ticket. Fun with friends. Although perfectly good as a solo endeavor, the walk makes for a great group activity, like this group of friends did ("This is something people do."). Both times I've made the journey, I've done it with a friend. The first time Nicole even joined for half the walk, another option if friends don't have most of the day to devote to Broadway. No need to pack food or water. There's plenty available for purchase along the way. It's safe! Even most local New Yorkers have never traversed north of Harlem and, thus, wonder about safety. Both times I've done the walk I've never felt even close to in danger in any way (but, of course, be smart and aware of your surroundings). Count on at least six hours walking time, more if you plan to stop along the way. CitiBikes line the southern half of the route. Although maybe technically cheating, don't be afraid to hop on a CitiBike for part of the journey. New York's bike share is available from the Upper West Side on down with checkout stations scattered along Broadway. During my most recent trip, my friend and I hopped on Citibikes to break up the monotony of walking in a couple places. Pedaling is great for a few blocks. Finding bathrooms can be a challenge. I've found ducking into one of the many Starbucks along the route to be the best bet. Finally, make the walk your own! 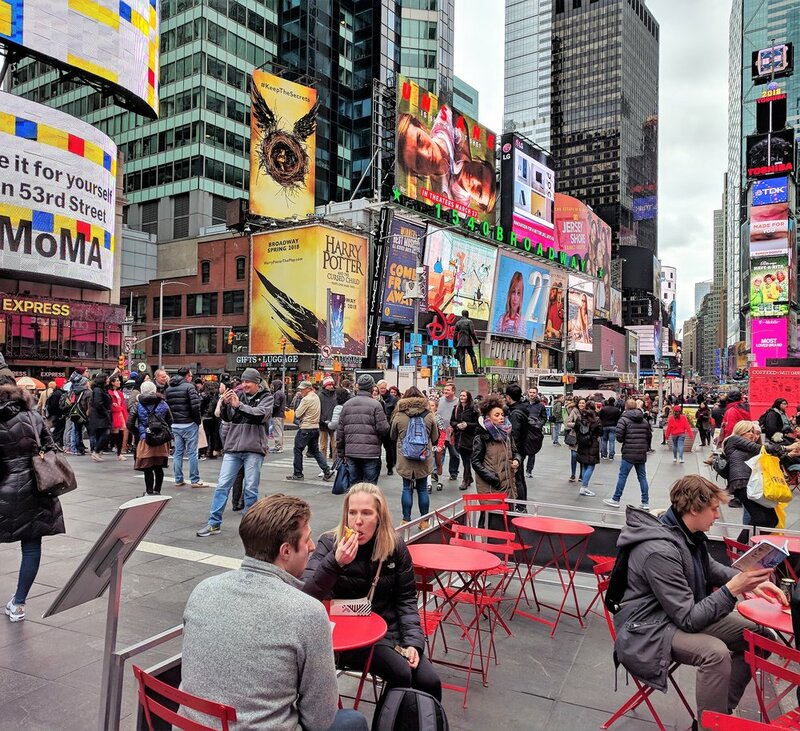 There are so many options along Broadway of places to see, eat, and drink. Meet up with a friend, or hike sole. Journey straight through making good time, or take it slower with stops along the way. There's no right or wrong way, only Broadway! Charging Bull near Wall Street. 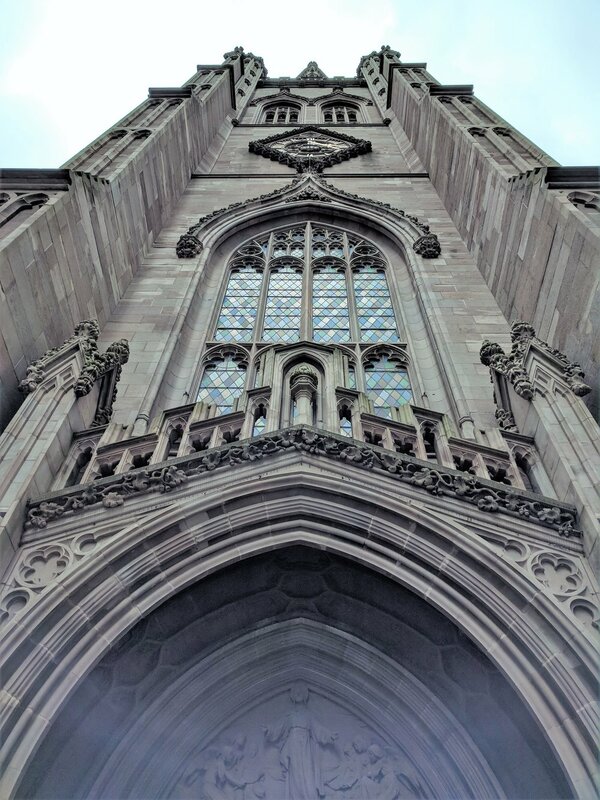 Trinity Church (Alexander Hamilton's grave is on the grounds). Zuccotti Park (headquarters of the Occupy Wall Street movement during 2011). Strand Bookstore (one of my favorite bookstores and an NYC institution). Madison Square Park (home of the original Shake Shack). Eataly (Mario Batali owned Italian supermarket home to many restaurants and a coffee shop). The Smith (trendy spot for eats and drinks). The John Dory Oyster Bar (Nicole recommended and approved!). Zabar's (iconic Jewish supermarket and deli). City Diner (stopped here for lunch on my most recent trip, standard diner fare). Fort Tryon Park (home of The Cloisters). Have fun, get out there and enjoy Broadway! It's the best way to experience Manhattan. Mission complete; Statute of Liberty in the distance. Give me such shows! give me the streets of Manhattan! Give me Broadway, with the soldiers marching—give me the sound of the trumpets and drums! Like this post? Check out Visiting Wayside Cider And The Union Grove Distillery In The Catskill Mountains Of New York.